Objection handling techniques are all over the Internet. What makes this (one of) the BEST posts on objection handling you’ll read this year? It’s the only one that involves hard data. We studied 67,149 sales meetings from our database of five million recorded calls. The team analyzed them with AI to identify what that correlates with success, based on data. 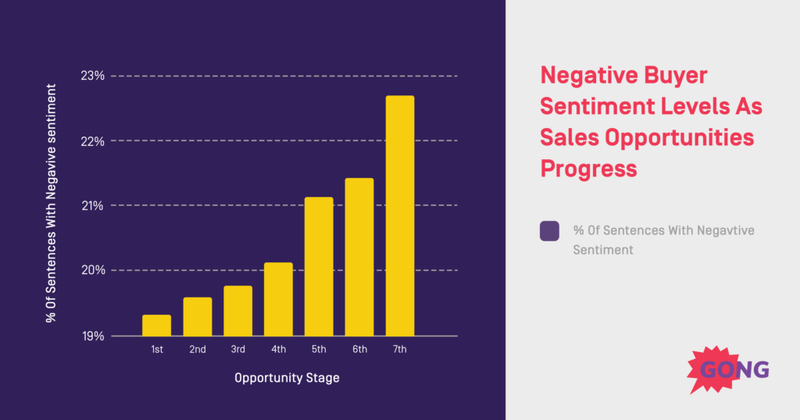 Dozens of things stood out, including how successful salespeople handle objections. 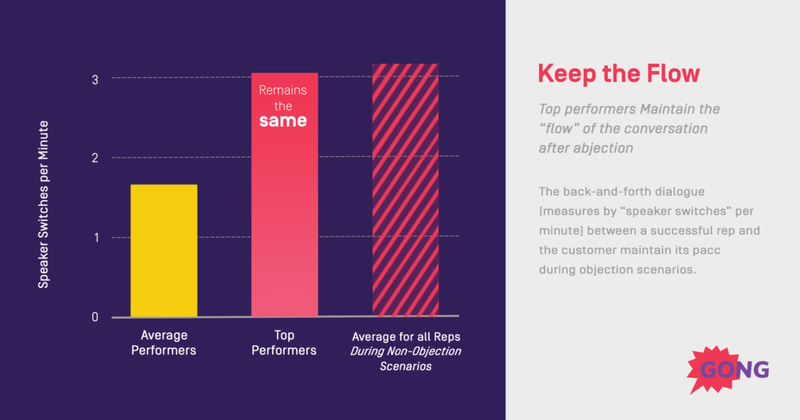 This post outlines everything we’ve learned about objection handling from both the data, and hard-won experience. Successful reps pause when they get objections. In fact, they pause for longer after an objection than during other parts of a sales call. It’s as if objections handling scenarios trigger them into slow motion. They also speak faster during objection handling. It’s as if objections make them nervous. 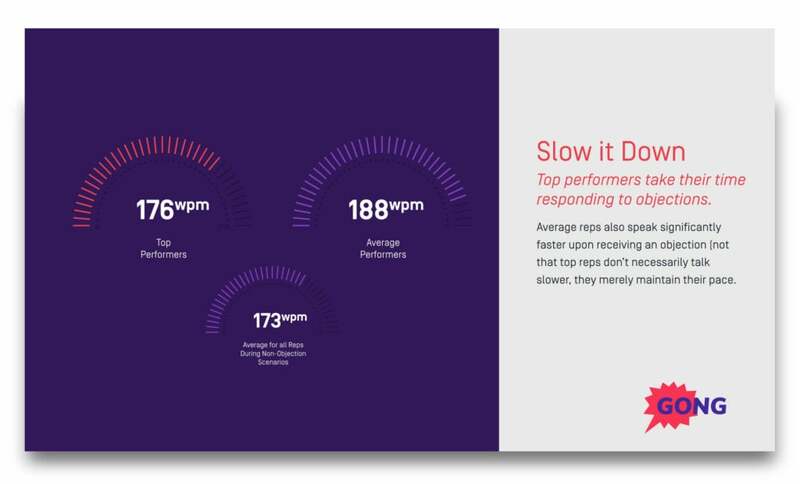 Consider this: In a typical sales conversation, average talking speed is 173 words per minute. But when flustered by an objection, a bad sales rep will speed up to 188 words per minute. Top producers slow it down during objection handling situations. If you maintain a calm demeanor amid a flurry of objections, you’ll build trust with your customer. The rest of the steps won’t matter if you can’t do that. 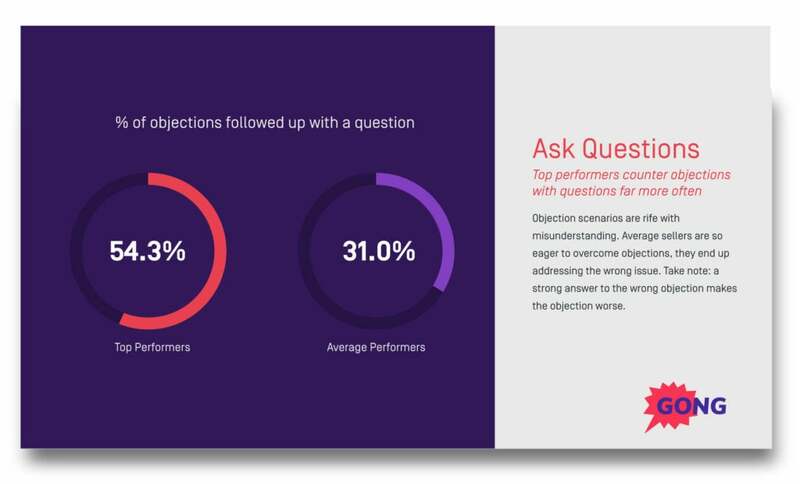 According to the data, successful salespeople handle objections with a question. Objection handling scenarios are rife with potential misunderstandings. If you don’t clarify them, you might address the wrong issue. Doing so creates friction. 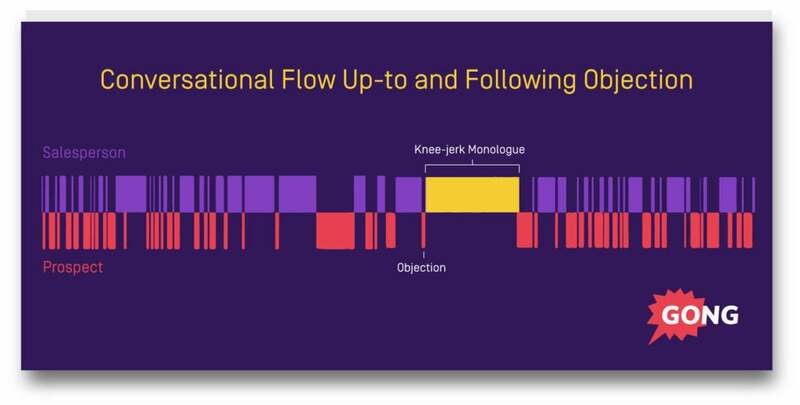 Now, here’s what low performers do instead: they react with a knee-jerk monologue. The customer voices a valid concern, and the sales rep spends the next minute steamrolling. Not only do they often address the WRONG issue, but talking for long streaks reeks of insecurity. What question should you ask to clarify and overcome objections? The first one is called mirroring. This tactic is from Chris Voss in his book Never Split the Difference. Here’s how it works: Repeat the last few words of your buyer’s sentence. And do it with an upward voice tone (like you’re asking a question). It triggers your buyer to elaborate. The key is to PAUSE and let your buyer further explain. Now here’s a warning. Ignore at your own peril. 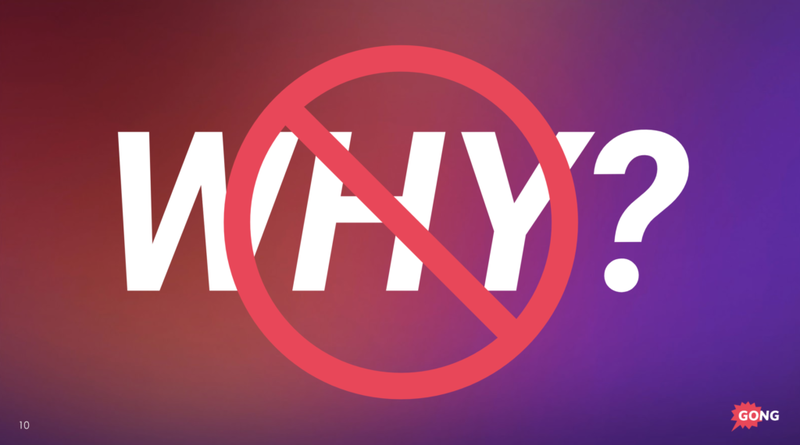 Don’t ask “why?” when handling objections. “Why” doesn’t clarify. It’s a threatening question that questions the validity of the buyer’s objection. It puts your buyer on the defensive. That leads us to the second type of question you can use to clarify objections. Can you help me understand what’s causing that concern? 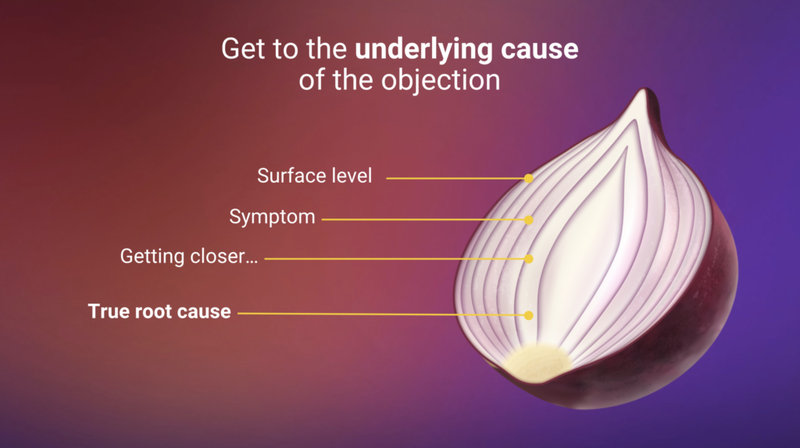 To sum up, overcoming objections is like peeling an onion. The core of the onion is what you want to address. Alrighty! You’ve played your patience card, bit your tongue, and asked a question (or two). GREAT! Your next objection handling technique is to validate the objection. I’m going to let you in on a secret… humans go through 95% of their lives feeling misunderstood. If you are the person who understands them, you’ll carry powerful influence. 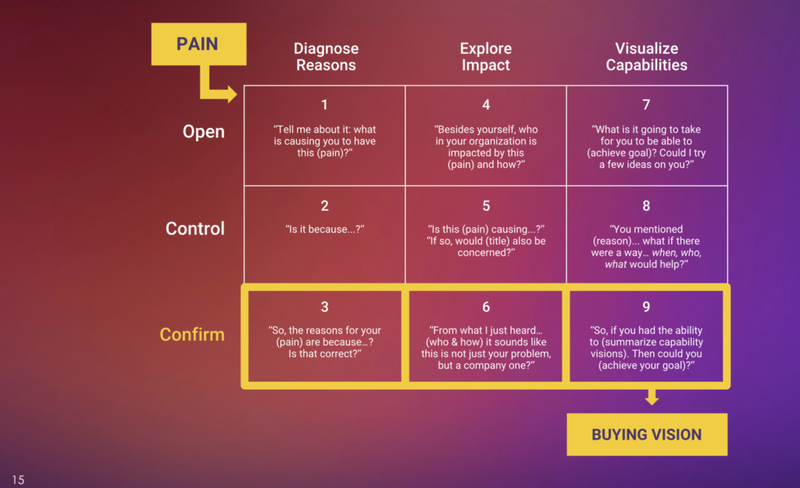 Giving your buyer the “gift” of feeling understood is so important, that the Solution Selling method dedicates three out of its nine types of questions to “summarizing confirmation questions” (questions that make your buyer feel understood). If you get this objection handling technique right, it might be the first time in your buyer’s life that they’ve felt truly understood. That’s how rare it is. Here’s the phrase that makes it happen. Fill in the blank with an emotion you observed your buyer express. “That’s a valid concern Stacy. It seems like you’re pretty torn on what to do here. Some objections are smoke screens. 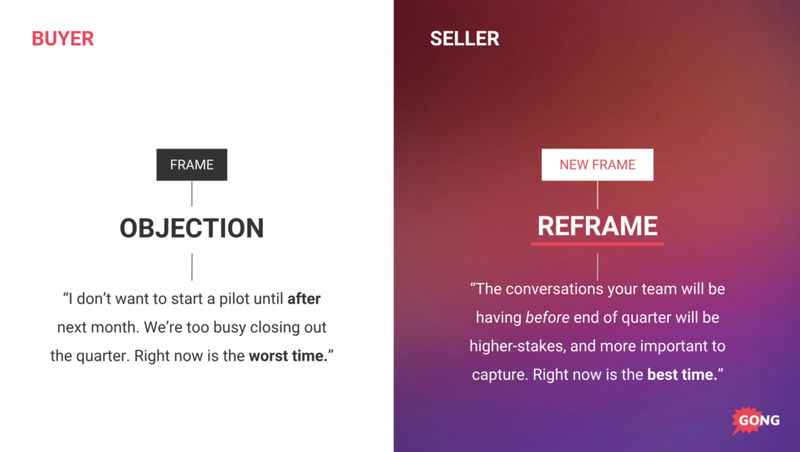 Your buyer’s words vs. what’s actually stopping them from moving forward are sometimes different. It’s your job to make sure you’re handling the true objection. Otherwise, you’re wrestling with smoke. 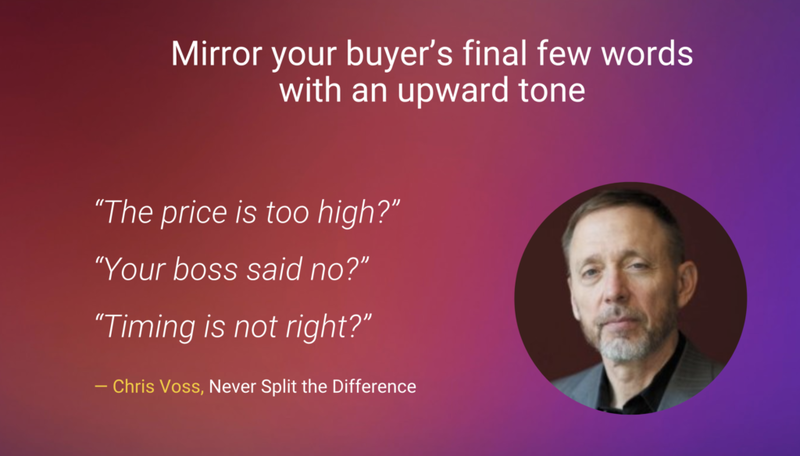 Here’s the exact phrase that gets your buyer to voice the true objection. If your buyer voices other objections, chances are those are the REAL objections you need to overcome. If they don’t have any others, then the first objection they voiced is the right one. Each of these steps in isolation seems SIMPLE. But when you put all seven together, magic can happen. Your next piece to the puzzle is to neutralize your buyer’s mind. Your goal is to make them receptive to a different way of thinking. Without this critical step, you’ll trigger resistance. You can do every objection handling technique, but if you leave this one out, your objection handling efforts will fall short. This question triggers defensiveness. Your buyer will not be receptive to your suggestions. It triggers the “rebellious teenager effect.” You’ll come across as lecturing. At best, the buyer will smile, nod, and then ignore everything you say. Can I bounce a few thoughts off of you? This question neutralizes your buyer’s mind. It implies that YOU are the vulnerable one, not your buyer. (NOTE: This example would not work without the previous steps. Without that padding, this is a trite argument. But with the previous steps, and with your buyer’s permission, it will change the way your buyer thinks). 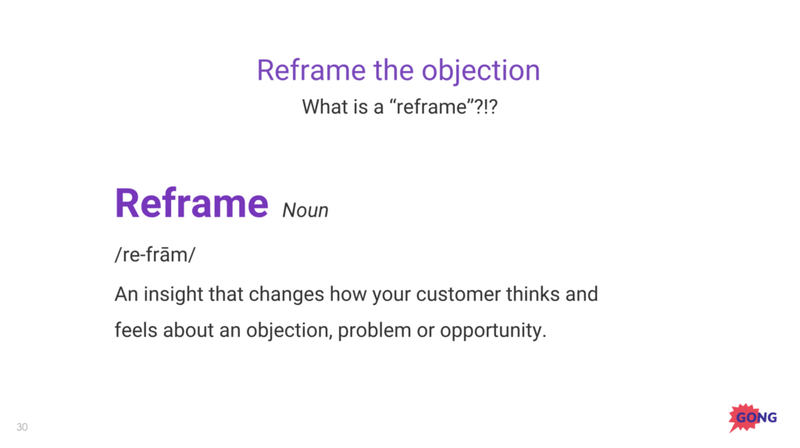 Stumped at coming up with your OWN reframes? Think of a common objection you’re currently struggling to handle. Ask those questions, and you’ll come up with some great reframes. Don’t LEAD the buyer to say what you want to hear. This leaves the objection unresolved, killing your deal later on. The exact phrasing of this question matters. That might lead your buyer to giving you a false “yes.” And remember: Objections buried alive never die 🙂 They come up later as killer zombies. Now, if your buyer responds with “no, we can move on,” CONGRATS! You’ve overcome the objection! Take your objection handling skills to the next level. That brings us to the end of the STEP BY STEP list of objection handling techniques. The above objection handling techniques are a step by step process. Here are a few other highly effective objection handling techniques that don’t lend themselves to a process (but are still super important). Every sales call has a flow that’s established early on. Great salespeople know that switching back and forth between speakers contributes to good flow and creates a healthy conversation. 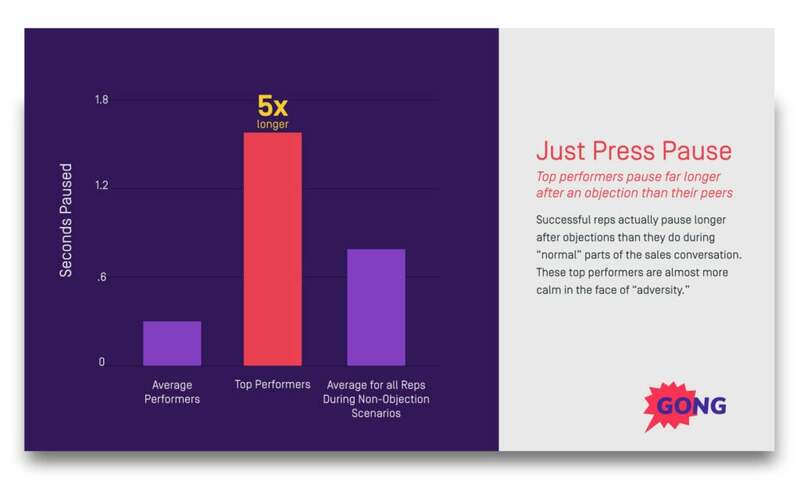 When objections come up, those reps don’t change a thing. That’s their winning strategy. Don’t try to suddenly dominate the conversation after getting a query. Keep it healthy. Switch back-and-forth between speakers like you always did. 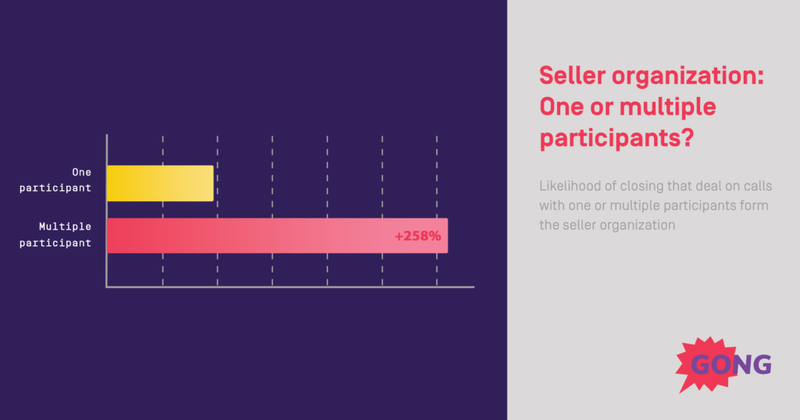 Team selling makes you up to 258% more likely to close a deal than flying solo. Recommendation #1: Have more than one participant, but not more than four, which is where the benefits start to drop off. Recommendation #2: Don’t have multiple participants during a discovery call or your success rate will likely drop. Do have them on any other call in your sales cycle. To be fair, some topics are touchy. Delicate. Uncomfortable to handle. For sales reps, the most difficult one is often pricing. So what do you do with pricing? How do you handle it proactively? Wait to talk about it. It may seem counterintuitive, but waiting is a strategy that top reps have used for ages. They bring up pricing much further into a sales call than their less successful peers. 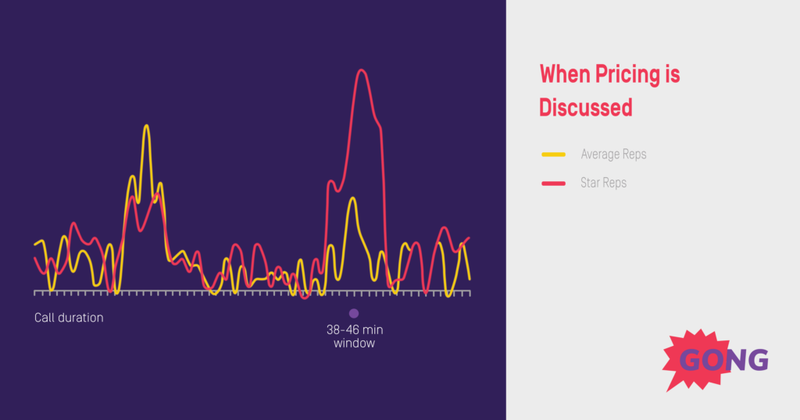 During a one-hour call, star reps raise pricing at the 38-46-minute window. Why does it work to wait? When you delay talking about pricing, the customer gets a chance to be impressed with your product. And if they’re wowed, they’ll likely have fewer pricing objections. Some of the top sales methodologies will tell you objections are a bad thing. When customers respond to your product demo in a way that seems too good to be true, it often is, and they won’t end up buying from you. Conversely, when they express concerns and objections, it can be a positive signal. Serious buyers pay attention. That means they dig in, get critical, and ask tough questions. They want to be sure your product is a great fit. Don’t let it shake your confidence. It’s a great opportunity to respond to their concerns, provide answers, and move toward a sale. And if they’re being too positive and not asking any questions, take a chance and probe a little. Take it upon yourself to find out what obstacles and reservations you’d need to resolve together to move to the next step. Download it, print it out, and tape it to your wall for everyone to learn from. 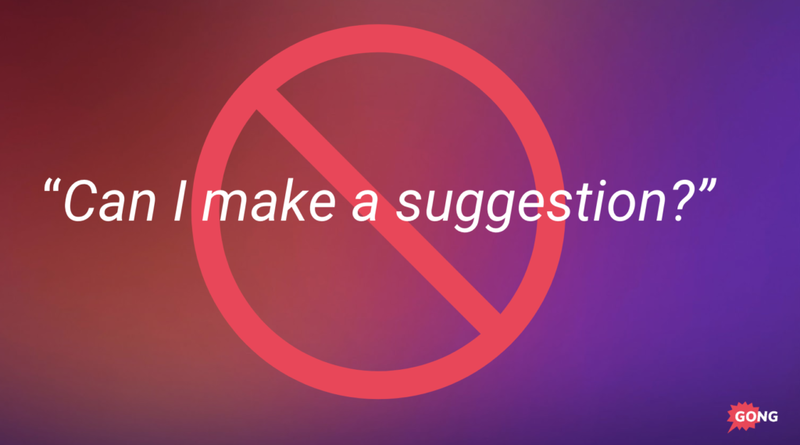 Try a few of these out the next time you’re handling objections, and let us know what works. Objection handling is the most important skill in sales.